A conservative group that has been defending embattled Rep. Jim Jordan released a quote from a former Ohio State University wrestler on Thursday in which he appears to recant his claim that the congressman — when he was an assistant coach — knew that the team doctor was sexually abusing the athletes. 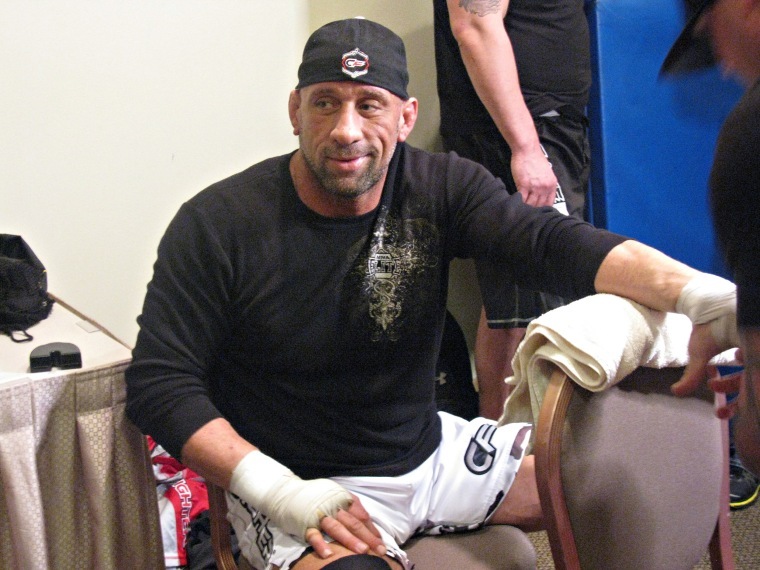 Mark Coleman, who is also a former UFC world champion, said in a press release supplied by Shirley & Banister Public Affairs that his previous comments "were not accurate." Coleman could not be reached to corroborate the comment put forward by the conservative group. But it stands in contrast to what he told The Wall Street Journal on July 5 — two days after NBC News first reported allegations from three other wrestlers that Jordan must have known about the alleged abuse by Dr. Richard Strauss. One of the wrestlers even said that he talked to Jordan about the doctor's behavior. Coleman had told the paper he roomed with Jordan on several wrestling trips when he was on the team in the 1990s. "There’s no way unless he’s got dementia or something that he’s got no recollection of what was going on at Ohio State," Coleman told the paper. "I have nothing but respect for this man, I love this man, but he knew as far as I’m concerned." A spokeswoman for the Journal said, "We stand by our reporting." Coleman, in the release, also said he was "distancing" himself from Mike DiSabato, whose abuse allegations sparked the current ongoing investigation into what Strauss allegedly did and how the OSU administrators and coaches responded. DiSabato, in a text message to NBC News, said Coleman was pressured to issue the new statement after Jordan, his brother, high school wrestling coach Jeff Jordan, and former Ohio State team coach Russ Hellickson all called Coleman’s parents. DiSabato’s account of the pressure placed on Coleman was corroborated by another former wrestler, who has spoken to NBC News before and asked not to be identified. NBC News has reached out to Jordan’s spokesman Ian Fury for comment and to Coleman’s mother, Connie. But it would not be the first time an Ohio State wrestler who came forward was asked by a Jordan ally to change his story. Last week, NBC News reported that Hellickson reached out to DiSabato and another athlete who wrestled for him, Dunyasha Yetts, and asked them to support Jordan. Hellickson’s appeal to help Jordan came after the congressman repeatedly said he had no idea that Strauss, who killed himself in 2005, was molesting wrestlers. Six former wrestlers interviewed by NBC News have said they believe Jordan must have known about the alleged abuse, but Yetts is the only one who said he had told Jordan about it directly. Other wrestlers, including two who spoke to NBC News, have said they believe that Jordan did not know about it. Coleman and Hellickson also appear in a videotape that DiSabato made his year — before the accusations against Jordan were reported — talking about Strauss and the lewd behavior they witnessed at the wrestling team’s headquarters in Larkins Hall. A staunch ally of President Donald Trump and founder of the conservative House Freedom Caucus, Jordan is vying to replace Rep. Paul Ryan as the next speaker of the House. He was an assistant wrestling coach at Ohio State from 1986 to 1994. Jordan has continually rejected allegations that he had any knowledge of Strauss' abuse. In an earlier memo, Shirley & Bannister collected quotes in support of Jordan from Hellickson and other former Ohio State assistant coaches. Hellickson called Jordan "the most honorable man I have ever known" but did not specifically back up the congressman’s claims that he no idea about Strauss’ alleged misconduct. On their website, Shirley and Banister note, "We have a conservative worldview and we only work with individuals, associations, corporations, publishing houses and institutions that share that view."